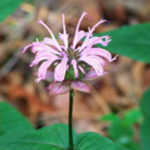 Adding native perennials to your landscape provides ecological benefits for insects and many other wildlife creatures and provides a more productive habitat for native pollinators. 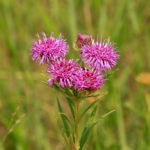 Native flowering plants and pollinators have co-evolved over time and depend on each other for reproduction and survival – in fact, research has shown that local native pollinators prefer local native plants. Native bees, honeybees, moths, and other insects pollinate the vast majority of flowering plants, and one third of our food crops. Native flowers are also vital food sources of nectar for keeping pollinator populations healthy. Because native plants are adapted to local climates, soils and growing conditions, they require far less maintenance, saving time, money and the most valuable natural resource, water. 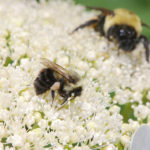 By incorporating these landscape-worthy natives into your garden, you will provide nectar and pollen for pollinators throughout the growing season from early spring through fall. One of the last wildflowers to bloom, this aster is loaded with blue-purple daisy-like flowers in late fall. 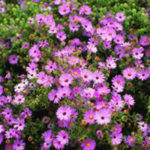 This aster grows into a tidy, compact, self-supporting mound and may be grown as a hedge. A clump-forming plant producing many long-lasting lavender flowers. A mint family member with pinkish to whitish, purple-spotted flowers in dense heads at the top of square stems. Each flower head rests on a whorl of showy, purplish, leafy bracts. Flowers attract bees and butterflies when they bloom in May and June. Clusters of indigo-blue, pea-like flowers in spikes followed by black pods. Foliage is blue-green and growth habit is shrub-like. A very long-lived perennial. Large, iridescent, red-violet, flat-topped flower heads on top of tall, strong stalks from mid-summer to fall give a rich display of color. An attractive plant from head to toe, not a “weed.” Sizable plant for the back of beds and rain gardens. Dark-green, lance-shaped leaves. 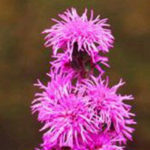 Intensely colored, pink-purple rounded flower heads line tall flower spikes in August and September. Butterflies flock to the flowers for nectar. The dried flower stalks are attractive into winter, and remaining seeds feed winter birds. A profusion of tubular, bright-white flowers on strong stems in May and June are magnets for many long-tongued bees. Used also by hummingbirds. Attractive seed pods are almost red in summer. 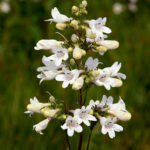 A hardy and versatile, long-lived beardtongue. The plants, consisting of rounded, year-round, dark-green foliage 3- to 5-inches high, spread moderately fast to form an excellent ground cover. 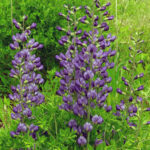 Flat-topped flower clusters appear in April and May 10 to 14 inches above the foliage. The thick, glossy semi-evergreen foliage looks a little like Lenten Rose and provides nice contrast to other native plants. Small yellow flowers in flat heads bloom April-June. The flowers are nice for fresh or dried arrangements. 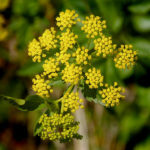 This member of the carrot family is attractive for its foliage and yellow flowers lasting six weeks, which are followed by ornate seed clusters. Very showy clusters of bright yellow flowers on stiff reddish stems with narrow leaves. 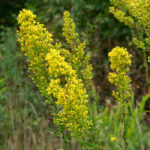 Clump forming plants bloom in late summer and early fall. The vertical flower clusters go well with rough blazing stars, New England aster, and other tall species. Well-behaved. A profusion of small white flowers bloom mid- to late summer. The flowers are an excellent source of nectar for butterflies. The narrow needlelike foliage is very aromatic and grows in a compact clump. Like many members of the mint family, Mountain Mint may be used in teas.